To develop resiliency of people in the community to cope with the effects of the 2015 Nepali earthquake. The catastrophic disaster of the earthquake in Nepal in 2015 increased the vulnerability of affected people to mental health and psychosocial problems. However, these increased needs were neither realised by the humanitarian agencies nor by their own communities, which were also suffering. The relief that was available was unfairly distributed, and not favourable to the poor and destitute, and many people were left frustrated. Many had to resort to living under temporary shelters, with poor security, in some cases for several months. The experience of directly experiencing great devastation, including during the many aftershocks, meant that many people developed mental health problems and worsening of existing mental health problems. KOSHISH is a national self-help organization and the only Disabled Persons’ Organization (DPO) working in the field of mental health and psychosocial issues in Nepal. As it was well established, it quickly initiated a programme to encourage people to cooperate among themselves to support each other and to provide mental health care services for those who required them. The external cost was 8.53 USD (8 Euros) per person receiving care, with much of the local costs covered by government through integration into existing services. The budget was 34,124 USD. "We developed a holistic model of intervention incorporating medical as well as social aspects simultaneously. This proved that needy people received quality and comprehensive services to bring about a change in their quality of life"
KOSHISH knew the situation well as it has been working in the district for more than a year. The weakness of the response during the rescue and relief distribution periods proved that Nepal was poorly prepared for such a disaster, despite the regular warnings that Nepal is prone to devastating earthquakes. Mental health and psychosocial support for the people who experienced the disaster was initially overshadowed by the dire need for basic material and medical support. KOSHISH, which means “making effort“ in the local Nepali language, in coordination and collaboration with governmental agencies and other humanitarian organizations, was able to initiate such support, making people realize the value of mental health and psychosocial support in the post disaster period. KOSHISH's presence in the community helped people to have access to Psychological First Aid (PFA), counseling, medication and more specialist psychiatric care, which helped people to manage their problems, including those who already had mental illness. The overall catchment area was divided into four different clusters, based on availability of government health facilities. Each cluster was headed by a psychologist, and each psychologist was mentored by a senior psychologist from the KOSHISH Centre. In the community, one trained counselor and one social worker were mobilized in each cluster. The counselors and social workers were primarily responsible for conducting PFA, carrying out door-to-door visits, providing follow-up, and conduct psychoeducation in the community, and they referred cases requiring a psychologist to the senior psychologist or psychologists for appropriate intervention. For the support that was beyond that which could be offered by KOSHISH staff, a system was in place for referral to the right organizations. Self help groups were established and were proactive in the community, playing a crucial role to promote awareness in the community, including by highlighting facilitators’ own issues. Many of them had their own story related to the earthquake; some of them lost family members, some had their house and other property damaged severely. By sharing their experiences, they were able to make the community realise that recovery is possible. Mental health and psychosocial effects of the earthquake do not all manifest immediately, so there will be a long-term need for these services. Large numbers of people having such issues reside in rural areas where the required services are almost completely absent. In this situation, KOSHISH was encouraged by the stakeholders to stay and expand the service level for at least three upcoming years. Based on the recommendation and need of the community, KOSHISH developed a plan to expand the project to Kavrepalanchok, Lalitpur and hence cover the whole of Bhaktapur District. This proposal has been developed in collaboration with CBM. This new plan will provide mental health and psychosocial support to seven thousand people living in the catchment areas. The program also considered the specific needs of people with disabilities in terms of mental health and psychosocial support. This project design is based on a twin track approach of providing direct service to the community, and conducting advocacy and promoting awareness to create a supportive environment in the community for the people having mental health and psychosocial issues to live and grow in equity with others. As an emergency response programme supported by CBM, from the very beginning, the progress of the project was tracked through a monitoring system which included field visits and observation by the KOSHISH Chairperson, Project Coordinator and a representative from CBM’s Country Office in Nepal. On a weekly basis, a progress report of updated data was compiled and submitted to CBM. This included a focus on stories of particular human interest that indicated the change made through the intervention. Similarly, during the project period, CBM representatives from the international level occasionally made field observations, consultations with stakeholders, and the beneficiary group. At the end of the project, a client satisfaction survey was conducted which showed that the intervention was felt by them to be appropriate, and accessible. The budget of the project was 34,124 USD (32,000 Euros) over a 10 month period. Project implementation was done in collaboration with government health facilities, which were utilized as focal points for field offices and for staff mobilization and monitoring purposes. This collaborative approach with government helped to implement the project in a cost-effective way for successful completion of the project. In addition, close contact was made with the community by using existing community structures (Village Development Committees). The intervention was carried out for ten and half months from 15 May, 2015 to end of March, 2016 3,892 people made direct use of the service, despite the short period of the project and the external cost was 8.53 USD (8 Euros) per person receiving care, with much of the local costs covered by government through integration into existing services. The budget was 34,124 USD. In addition to this, the presence of the programme in communities significantly helped the community members to understand more about mental health and psychosocial disability. 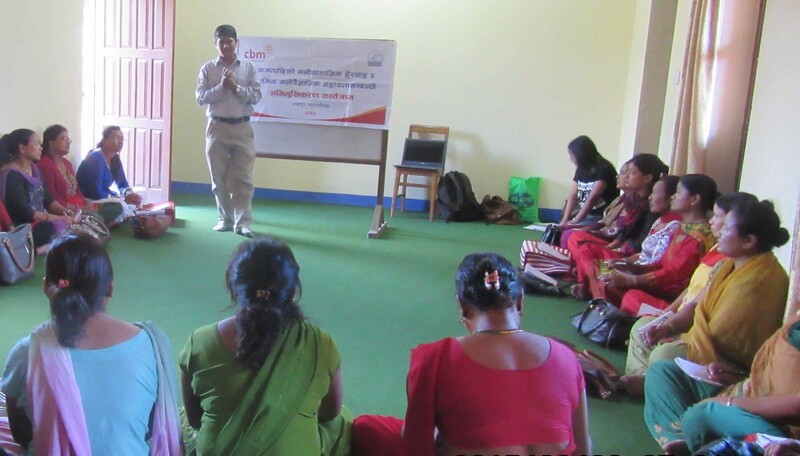 In collaboration with these community members, and with CBM, a new phase of the programme is due to start in 2017, extending coverage to more municipalities of Kavrepalanchok and Southern Lalitpur district.